Well known for its Gears of War series, Epic Games is also a driving force in the gaming industry because of its popular Unreal Engine platform. Founder Tim Sweeney and the rest of the folks at Epic have decided to leverage its status in the industry to offer a multi-million dollar pool of funding available to selected game developers. 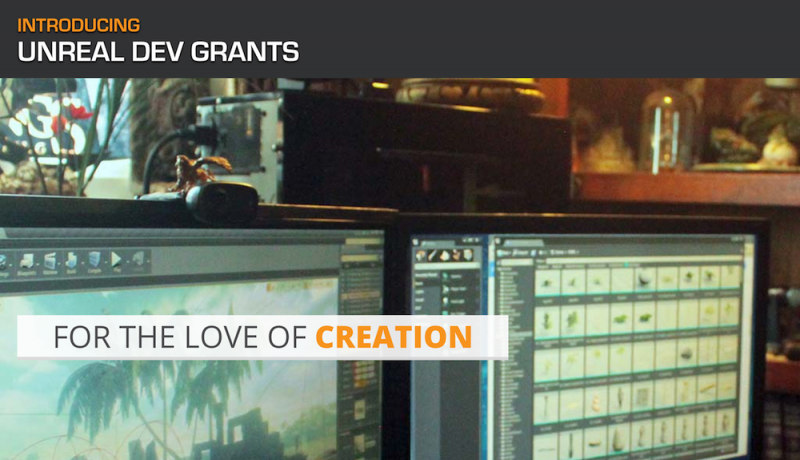 The $5 million pool is known as Unreal Dev Grants, and is available to anyone Epic deems fit that is creating interesting projects in Unreal Engine 4. The company will be handing out cash in increments of between $5,000 and $50,000 and according to the company there are absolutely no rules or regulations on how the money gets used. "If your project merits awesomeness, then we'll give the award out. We don't want to put ourselves in a position of accounting for anybody's funds. It's your money at that point and you can do with it what you want. The kind of teams that we're looking at doing these projects are super motivated to do good work, and so I doubt we'll see anybody doing anything other than furthering their project goals." Unreal Dev Grants’ current set-up appears to be just the start for Epic. The company plans to offer an Academy Awards-inspired system, where past grant winners help decide future recipients and more. It looks like that end of the project’s infrastructure is still in development though. Sweeney said the “goal of this is to help developers who are in that sort of position get to the next stage without having to mow lawns” the way he had to when trying to find his earliest projects.